Having been diagnosed with both depression and anxiety disorder last year, there have been many times where I’ve felt like there’s ‘no light at the end of the tunnel’. But how wrong I’ve been. What is this ‘light at the end of the tunnel’ that we continually seek? Personally, I’ve re-evaluated how I view happiness and the ways in which to attain it. However fleeting the feeling may be; however dark my day may seem; I’ve come to learn, that happiness and love is always around me, I just need to open my eyes and find it. Whether it’s in my mother’s hug; in an empowering song; in the fresh air; or simply my boyfriend’s really bad jokes. (I’m still not sure why they make me laugh…) If I’m open to it, I know that happiness will be made present. This realisation hasn’t been an easy one, it’s taken a lot of rewiring to try and feel so positive. One thing that has helped tremendously is keeping a ‘happy diary’. Putting to use my beautiful notebook embossed with my initials (thank you Sally! ), I’ve made a point of writing at least one ‘happy moment’ from my day into it. Research has shown, that the physical act of noting down our emotions (happy or sad) triggers feelings of catharsis. In the case of a ‘happy diary’, paying attention to those positive parts of your day help you to remain reflective of your life on a micro-scale, and contribute to the reduction of stress and anxiety. Personally, I’ve found my little project so rewarding, and after a few months of deep inner turmoil, I’ve wanted to be able to share with you, just how much this has helped me. Maybe you’re struggling with your mental health, having problems in the workplace or at home, or simply want to be able to acknowledge the beauty of each day. 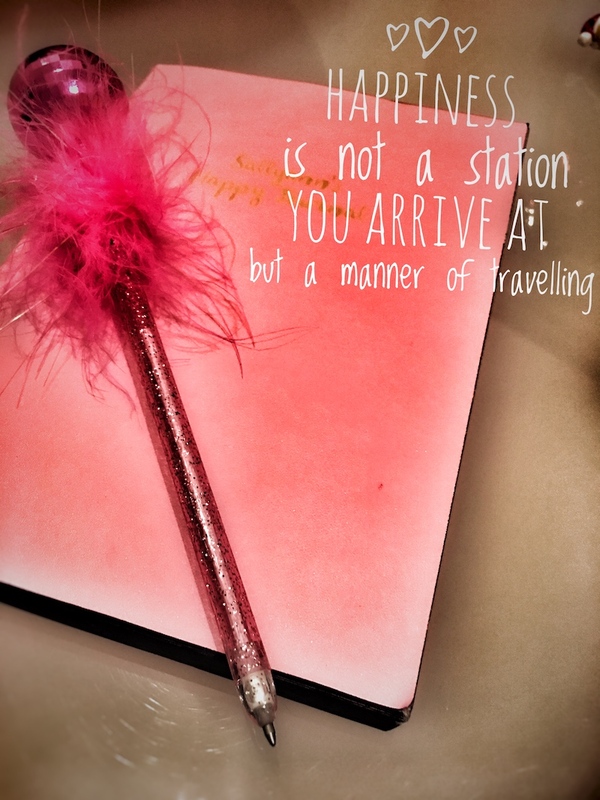 If so, why not start your ‘happy diary’? At the end of the week, month and maybe even year (if you’re committed enough), I truly hope you’ll be able to see that however tough your journey has been, there’s always a reason to simply smile and be happy.